Do you know what there isn’t enough of in the IT service management (ITSM) industry? The sharing of key takeaways, advice, and tips gathered at industry conferences. If we’re lucky we get to see a few “golden nuggets” among the vendor booth tweets in the Twitter stream. Thus, events come and go, and those who attend hopefully get value from them. But there’s often little for the rest of us – sat in the office, unable to attend, and hungry for information to learn from. Not only does this lack of “sharing” prevent a greater audience from benefitting from our ITSM events, but it’s also (in my opinion) one of the biggest missed marketing opportunities out there. If you have budget to attend just one ITSM event next year, how do you know which one to attend? If you’re lucky, you may have been to a few already – which might give you some form of indication as to where to start. Or you might benefit from a little “word of mouth.” Otherwise it’s a case of trailing through those horrific “come see how amazing we are at booth 666” tweets or relying on (often poor) conference marketing collateral to make your decision. Personally, I’d rather read or hear about the actual content from a past attendee, see what topics were being discussed, and what advice was being given, to help me decide whether or not the event might be valuable for me to attend in the future. And so to end my long rant/introduction, I wanted to share with you my experience of attending Freshworks’ first global user conference in New York (#Refresh18). If you’re interested to know what the event was like, what the key messages and learning points were, and/or to perhaps get a feel for them as a potential future ITSM tool partner, then please read on. This shouldn’t be “news” for anyone reading this article. “The age of the customer” was a term coined by Forrester Research back in 2011. Seven years later, if you’ve still not got around to comprehending what this means as a provider of IT support, you’re in trouble (and that’s putting it mildly). That business functions (regardless if they’re providing internal or external support, or whether they’re a part of a completely different department) need to understand that their success hinges on customer happiness. And, as Freshworks CEO and co-founder Girish Mathrubootham wisely said: “Customer support isn't just the responsibility of the support team. The entire business needs to come together to support a customer at any given point.” Put simply, the message throughout the conference was – ignore your customers and you will fail. 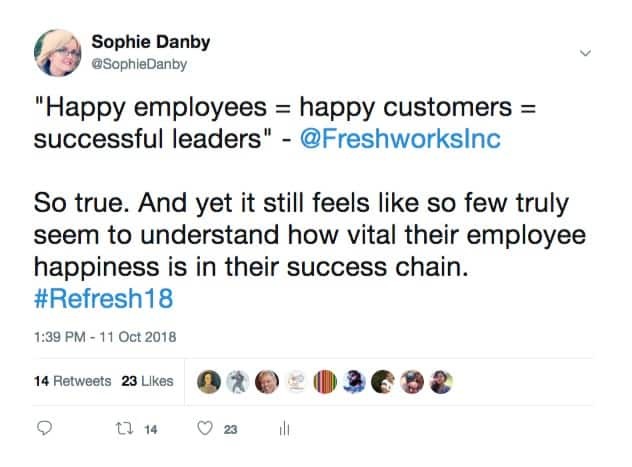 That Freshworks practices what it preaches. Whether it was Venkat Balasubramanian, Director of Product Management Freshservice, stating that “At Freshservice, our mission is to enable IT teams to deliver ‘moments of wow’ to their customers.” Or David Thompson, Freshworks’ CMO, gearing up the audience with “We're here to empower YOU to give the best experience to YOUR customers.” It was abundantly clear that Freshworks understands the value of partnering with its customers and delivering the best customer experience possible, and that they know that they can’t rely on technology alone to guarantee their (and their customers’) success. Involve your customers ­– Don’t adopt a new way of working, change or create a process, or assume you know what customers want without their input. Ask them. Invite them in. TALK to them. Scrap the jargon – Your customers speak human, not tech. Would you attempt to speak to a Spanish-speaking person in Chinese? ITIL, COBIT, VeriSM, ISO20000… who cares? Scripts, workflows, “a correct way of doing things”… who cares? Certainly not your customers. Nor your competitors who are leaving you behind while you pray to the god of process and fail to bring yourself into the new age of service management. Don’t get me wrong, we all love a bit of process. But the key is knowing when the process isn’t as important as the issue, or the business, or the customer. It’s knowing when to “let go” of process in the pursuit of delivering value. It’s understanding that the process is not your end goal, and your success doesn’t hinge on whether or not you “correctly” submit a ticket before actually solving the customers’ issue. The fact is that, in ITSM, we’re often so caught up in our process documentation (and in doing things the way they’ve always been done) that we keep missing the bigger picture – the business. Newsflash: It’s not about your processes (or your technology) – it’s ALWAYS about your customers. It’s never an IT issue, it’s a business issue – Email down? Internet access disappeared off the face of the earth? It’s easy to think “We have an issue with our technology,” but what you really have is an issue with the business not being able to communicate to suppliers, customers, prospects, etc. What worked before might no longer be relevant – if a process was designed to deliver great IT support 10 years ago, the chances are that there will be elements of it that are no longer fit for the current expectations of customers. This was a very hot topic across all of the Freshworks’ product streams. Not least because #Refresh18 was used as a launch pad to introduce (the adorable) Freddy the Bot into civilization. The shortish version of this news is that Freshworks’ has smartly partnered with Google to power the artificial intelligence (AI) capabilities within their software – i.e., using proven technology instead of doing what a lot of vendors are doing: trying to create something from scratch. The longer (and likely more accurate) version of this can be read here. It was also nice to hear the importance of knowledge management come up on more than one occasion (finally!!!). I also have to commend the fact that there was no “AI is going to take our jobs” scaremongering, with instead a focus on how using AI for low-level tasks ultimately frees up service desk people to focus on more value-add activities. Don’t just focus on the technology ­– In a world where simple tasks are automated, or handled by AI, retaining staff will be harder, skill sets will change, expectations will be higher... You need to plan ahead now and think about what the service desk agents of the future will look like. Machines learn like humans – No AI technology is going to work by itself. Imagine hiring a new agent and giving them no information on how the business works and then locking them in a dark room so they can’t find out for themselves? The same is true for chatbots and other AI technology, give them nothing to learn from (no knowledge) and they’re going to be about as useful as chocolate teapot. Overall, the mood around AI was positive – Freshworks’ customers certainly seemed engaged and excited over Freddy in particular. In fact, even though I openly loath the likes of Alexa, would rather type an essay than talk to Siri, and complain every time I have to endure a conversation with a chatbot, I was impressed with what can be achieved with this cute little dog. This deserves an article all of its own. Quite frankly, mental health in IT right now is bigger than any discussion around AI, digital transformation, or customer experience. After all, none of these things are going to succeed without healthy, happy people supporting them. 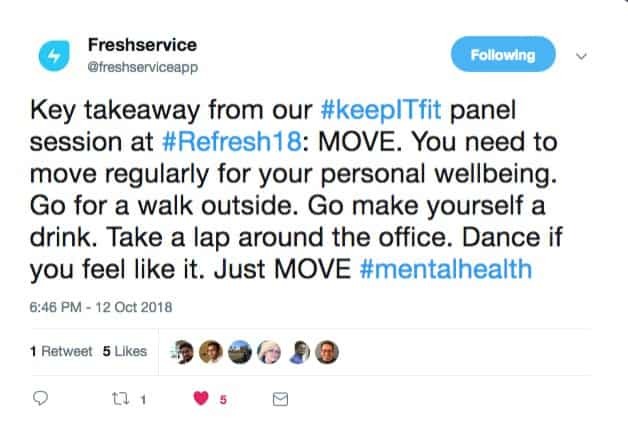 In a nutshell, prior to #Refresh18, Freshworks launched a #KeepITFit campaign to help to raise the awareness of the importance of physical and mental health in the workplace (please check it out and contribute as the team are donating money to mental health charities for every social post that uses the hashtag). And, as part of this, they featured a panel discussion on the same topic. Now I’m going to be brutally honest here and say that the panel was a little bit of a letdown for me. Nothing against the people involved, but I don’t think it achieved its purpose. I don’t think this really has much to do with Freshworks, but was more likely to do with the US participation and audience – where the mindset around mental health and things like working longer hours is much different to that of other parts of the world. It’s widely known that the US has some of the shortest vacation-days allocations in the world, yet still nearly everyone in the audience stated that they don’t take all the time off that they’re entitled to year on year. This is crazy – we should be working to live, not living to work! As a result, a lot of the panel conversation and advice was around things to help your mental (and physical) health while AT work. So, for example, taking regular breaks from your desk. It was also very apparent – thanks to Suman Gopalan, Chief HR Officer at Freshworks – that Freshworks’ people policies are very much focused on the health and wellbeing of its employees. But for me, if we’re truly going to combat mental health issues in the workplace, we need to be doing so much more than walking to the coffee machine and back. The panel never really touched on the longer-term impact of stress, or the deeper issues around mental health – and we need to stop being coy about it, we NEED to have this “darker” discussion. In my opinion, Stephen Mann hit the nail on the head when he said: “We talk about ‘work-life balance’ but this is wrong before we even start. We should be talking about ‘life-work balance’.” I think this is a great starting point for changing attitudes and mindsets. Taking time off work is not a sign of weakness – It doesn’t mean you’re not committed. It means you’re human. We need to switch off – We’re not robots. We don’t need to be “always on.” You don’t need to respond to that email at 11pm or stay late in the office as a sign of hard work. Good work is shown in the value you deliver, not in the volume of hours worked – so take a break! Talk, talk, talk – Join the #KeepITFit Speak to your partner, friend, or colleague. Talk to your boss. Tell someone how you feel – if you’re struggling, if you feel stressed, if you need support. Likewise talk to them to see if they’re the ones who need a little help. Let’s ditch the stigma – it’s totally OK to not be OK. And the more we talk, the more we openly have these discussions, the healthier and happier we’ll be. It was good. Like really good. The event was pulled together in less than two months and run more efficiently than some events I’ve attended where teams have been working on it all year. Customers were passionate. Freshworks people were passionate. And it had a similar feel to the smaller Knowledge events before they became the now-giant, world-renowned Knowledge events. There were, of course, plenty of improvement opportunities for next time (hey, if you’re not improving then you’re standing still). 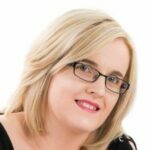 Small tweaks that could start to take the event from a user conference to simply a global ITSM conference (again much like the Knowledge event). The mesh of different audiences (ITSM, customer support, sales, and marketing) across their core products needs a little more focus – keynotes that are relevant to all parties rather than just one subset, for example. And perhaps a better understanding of customer case study content (the audience are already customers, they don’t need a tool selection story). But overall, I was genuinely amazed at the quality of the event that Freshworks managed to pull together for their first attempt (and in such a short space of time!). Year-on-year we see event attendance volumes decrease (specifically in the ITSM space minus the aforementioned Knowledge event) yet next year #Refresh19 is aiming to be triple the size. And I definitely think that they’ll hit that target. 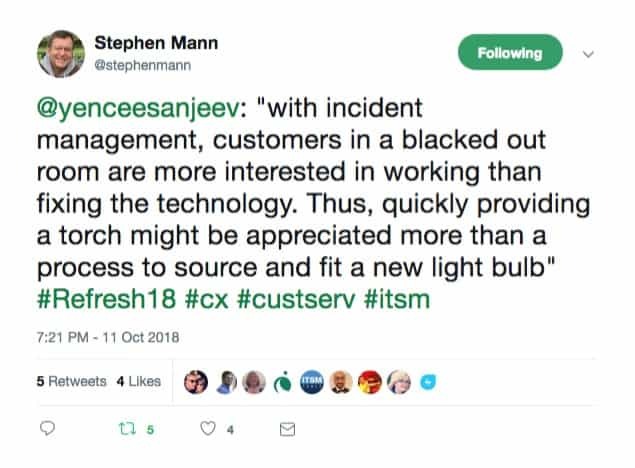 Of course, their audience is not just ITSM, so service management competitors who are panicking should probably take that into account (though I wouldn’t completely park the concern over the speed at which Freshworks is growing – keeping up is going to be a big challenge specifically for the SMB vendors) if Freshworks hits their 2019 target. I’m excited to see where Freshworks takes things from here, specifically with their focus on their 360 platform. And, those who have been paying attention will notice that I referenced ServiceNow three times above – now that doesn’t mean I’m saying Freshworks are the new ServiceNow or are going to be a contender against them (plus I’m also not saying that they won’t be). 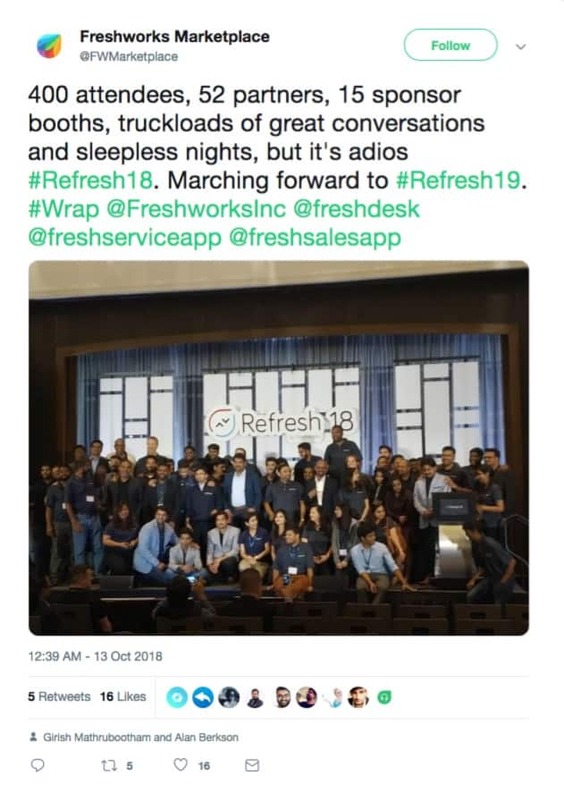 Just that being with the Freshworks team, hearing their plans, knowing how heavily they’re going to invest in marketing, and aiming for a bigger conference… you can’t help but think back to the days of when ServiceNow were attempting (and of course ultimately became very successful at) the same thing. 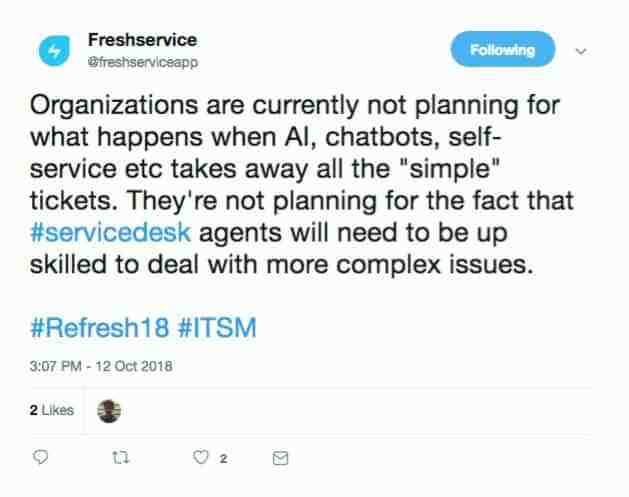 It’s been a while since the ITSM tool market has seen a shake up, and I personally think that it’ll be interesting to see where Freshworks are at come this time next year when they’re wrapping up #Refresh19. It's time to assess your service desk’s performance over the past year and develop an improvement strategy for 2017. Here's six tips to get started.